Why a World Heritage Site? Everything comes back to life. In mid-May, the cows give birth to their calves. The year begins. The brown bear has left its winter lair, and a new-born calf is an easy prey. In the forest land and on the south slopes of the mountains, patches of bare ground spread and grow. Water gushes in the brooks and fills the marshes. Waders and whooper swans give concerts in the light nights of spring. In the mountains, it is easiest to travel at night on the snow crust. The crust disappears before lunch and no longer carries a weight. The time is right if you want to experience the birdlife of Laponia, but forget about travelling long stretches. This is a transitional time between travel on snow and travel across dry ground. Streams and river are brimming over with meltwater. The spring flood makes many of them impossible to wade across, so it is best to settle for staying near the mountains and the low fells. Soon the wetlands will be teeming with life. Every spring, a wealth of crustaceans, frog spawn and worms attracts waders from far away to nest here. The bird chorus dies down by midsummer. Mosquitoes and gnats hatch and begin to pester man and beast. On the open wetlands in the forests, forest reindeer gather to keep cool, and then the calves can be marked. As in the past, angelica is picked among the delicate greenery in the mountain birch forest, and common sorrel on the meadows. Powerful forces are in motion. The sun has turned towards our part of the world. Year after year, all creatures return to the same spot. The Arctic Tern has returned from the waters around Antarctica, and the reindeer from the forests to the east. All the plants and animals remember their place in the vast summer land where there is no darkness. In a few intensive months the animals and plants grow strong. People live well. At the end of June, the reindeer herders begin work to round up the reindeer for calf-marking. The marking is done in the cool of the night. Now we live as though the long, harsh winter with his icy winds and bitter cold did not exist. When the first star begins to shine in the night sky, summer is over. The geese and other migratory birds collect and set off southwards. Silence falls over the trees and mountains. In the forests, on the marshes and on the moors, the berries are ready for picking. In good years, the reindeer can eat their fill of mushrooms. The necks of the bull reindeers grow thick and they rub away the velvet from their antlers. A harvest time of sorts begins. Plants, berries and herbs are to be gathered and buckets of fish for winter need to be caught. In the autumn darkness, the lynx stalks closer to the resting reindeer. Autumn storms and night frosts make the ground cold. Forest and mountain creatures prepare for the approaching winter. At the beginning of September the reindeer herds are rounded up and everyone helps with the slaughter, before the bull reindeer are on heat. Moose hunting is a time we long for. The migratory birds gradually form large flocks that confer on when to begin the journey to warmer climates. The ptarmigan get their first white feathers. When the first star lights up late one evening, we reluctantly accept that summer is over. The first thin snow covering comes. The forest has turned black. The bear goes into hibernation and the mountain Sámi communities gather their reindeer to separate them into winter groups. The reindeer are moved to the winter foraging land and reindeer are slaughtered for winter food. The animals leave tracks in the snow, revealing themselves. There is something secretive and slightly melancholy about this time. It is an unpredictable time in the mountains. Storms gather. For a few hours in the middle of the day, the landscape is coloured orange by the weak sun. A winter’s night is never completely dark. On clear nights the moon casts sharp shadows on the snow. On a cold night, stars grow in the sky. The Milky Way is called Lodderáidaras, “birds’ ladder”. The migratory birds use it to find their way south. Late in the evening, three stars climb over the horizon. They are the three skiers, hunting wild reindeer or the big moose. About an hour later, the old man comes skiing in their tracks. Each day grows a ptarmigan step brighter. Those who travel in the mountains and forests have just a few hours. When the sun returns it brings little warmth, but it cheers up frozen souls. Each day is one ptarmigan step brighter than the one before. Those who travel in the mountains and forests have just a few hours. When the sun returns it brings little warmth, but it cheers up frozen souls. Now at last the sun is starting to spread warmth. The migratory birds return. In the mountain Sámi communities, preparations start for the westward migration to the summer land. There may be a blazing sun or a stiff wind and snowfall. In the forest the snow is still deep and heavy. The mating calls of the owls can be heard in the old-growth forest and the woodpeckers are hard at work. Almost overnight the days begin to dazzle and the nights grow short. Skiers come to Laponia, but we must always be prepared for weather that can brutally change all plans. Your browser does not support the audio element. Your browser does not support the audio element. Your browser does not support the audio element. Your browser does not support the audio element. Your browser does not support the audio element. Your browser does not support the audio element. Your browser does not support the audio element. Your browser does not support the audio element. The mountains are the home of the wind. On the highest summits it is often the wind we hear. High up among the alpine summits the wind is in the company of only the glaciers and the very hardiest survivors. But our mountains also comprise the broad green plateaux of Badjelánnda, which lure the reindeer westwards for forage. They comprise the low fells in Sjávnja and the brushy valleys of Sarek. Here, birds suddenly fly up when you come to near. Species grow here which are not found anywhere else. Through binoculars we can see for mile after mile. White reindeer are not numerous, but they stand out like summer stars on the rim of the mountains. Our mountains often have ancient names that tell us something about what they look like or how they have been used. The name can tell us that a mountain is round or steep, stony or verdant. Place names in Laponia tell indirectly of how our land has been shaped. Laponia has been designated a World Heritage Area partly because it is here the geological formations are seen so clearly. We see how the ice has carved out the vast valleys and how the bedrock has risen. For the people who have lived here ever since the most recent ice age there have been many different types of land to live on. Autumn fells, spring fells and summer fells. The discreet traces we see all over the Laponia mountains tell of how over the generations we have learned how to survive life in the mountains. It is only in the depths of winter we have left the mountain and sought shelter in the forestlands. Urban Emanuelsson tells of how important rodents are in the mountains. In Laponia, there are large areas of mountain birch forest between the conifers and the open mountain. There are seldom fires in mountain birch forest, it is instead the larvae of the autumnal moth that eats the birches in some years. If the birches are devoured a second time, they often die. This opens up the forest and there is an upswing in flowers and animals. Mountain birched grow either as single trunk or multi-trunk birches. There is much to indicate that felling for firewood is the reason why there are many multi-trunk birches in certain areas. There are seldom fires in mountain birch forest, it is instead the larvae of the autumnal moth that eats the birches in some years. 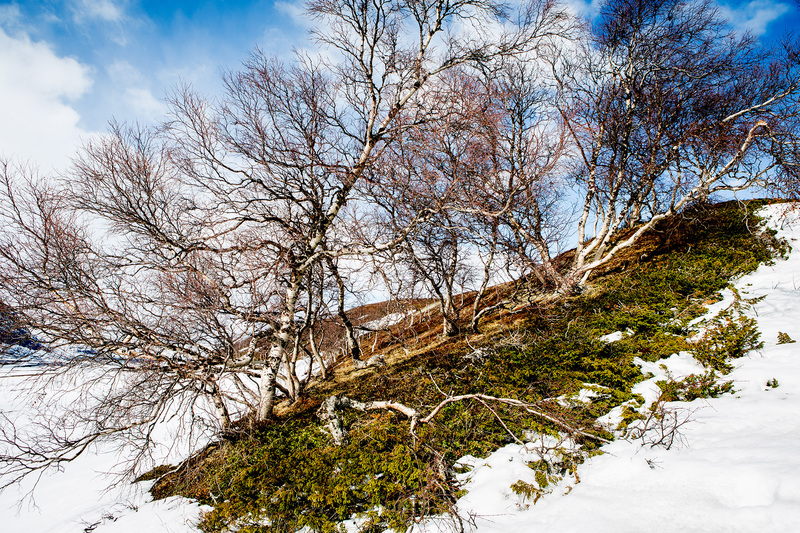 If the birches are devoured a second time, they often die. This opens up the forest and there is an upswing in flowers and animals. When work had gone well we often sang that Jiegŋáffo luohti. But when it had not gone well, when we had been unable to round up the reindeer and the weather was bad, we would all stay silent. In the past we would say that the reindeer assembled on Jiegŋáffo from every direction. When you are travelling with the herd and you are here on Jiegŋáffo, you can once more see reindeer that have been missing for years. It is that kind of mountain. One that gathers lots of reindeer. That was precious when the summer was warm. The biting blizzard on the bare mountain. The heavy silent snowfall that never ends. The boiling rapids from the glacier. In spring all this water begins to irrigate and give life to the ground and everything living here. Without these snow beds on the mountain, many plants there would never bloom. To people, the lakes and watercourses are good transport routes in both winter and summer. And the food store that never empties. The reindeer affects more than just the reindeer herder’s life. It also contributes to forming the landscape when it fertilises the ground and keeps the mountain landscape alive. The animals’ foraging and trampling keep the land open and even affect where the tree line runs. Without the reindeer’s foraging the forest would creep higher up on the mountain.